Car crashes can be horrible, especially for those who are not at fault—meaning their injuries are caused by negligent or reckless drivers. Your property may have been damaged in the accident, and you may have been severely injured during the accident. It could be that you suffered an injury that does not immediately present symptoms, or you could suffer an injury that will have a long-term or lifelong impact. Car accidents can produce a wide variety of injuries that can range in severity from anything between a minor cut or bruise to a serious, debilitating permanent disability. According to the Center for Disease Control, car accidents account for nearly 1 million days of hospital visits per year in the United States. The car accidents that occur in a given year cost about $18 billion dollars in medical expenses and cost approximately $33 billion dollars in lost work productivity due to injuries. The typical car accident-related emergency room visit costs $3,300, and the hospitalization costs associated with a car accident are typically around $57,000. Cuts, bruising, lacerations, and scratches. Burns from fire, hot metal, or chemicals from the deployment of the airbag. Injuries to the eyes and face due to broken glass. Lost limbs due to crushing during the accident. Internal injuries to the organs. Emotional harm, such as post traumatic stress. Injuries to the neck, back, and spine. Injuries to the nervous system and spinal cord. Anyone who has been involved in an automobile accident should insist on being evaluated by a medical professional, even if he or she does not feel injured. Some injuries can take some time to set in and develop symptoms. Swelling can occur hours after an accident, and there is the risk that an accident victim could have suffered some sort of hard-to-detect hemorrhage in the brain or internal organs that may not hurt at first, but will get worse over time. Make sure that you see a doctor and get the medical treatment you need for your car accident injuries, even if you are worried about the medical bills or are unsure if your insurance will cover the care you need. You could be eligible to file a personal injury claim, which could get you the financial compensation you need to cover the medical expenses associated with your car accident injuries. Whether the victim was wearing a seat belt properly. Whether speeding was involved in the accident. Whether the other driver was under the influence of drugs or alcohol. Whether the other driver was distracted while behind the wheel. Driving safely, remaining vigilant and attentive while operating a vehicle, and using seat belts are all ways that drivers can help reduce their risk of being seriously injured if they are involved in an automobile accident. But no matter how careful you are, an automobile accident can still happen to you. If you have been involved in an automobile accident in Nevada that was caused by the negligence of another, you may have a valid personal injury claim against those who are responsible for your injuries. 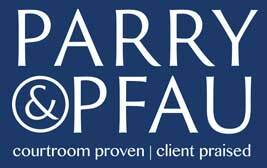 Do not delay in contacting the team at Parry & Pfau for a free initial consultation concerning your potential personal injury claim.